Habersham County, GA– In May of last year, Bounkham “Baby Bou Bou” Phonesavanh, 19-months-old, was asleep in his crib. At 3:00 am militarized police barged into his family’s home because an informant had purchased $50 worth of meth from someone who once lived there. During the raid, a flash-bang grenade was thrown into the sleeping baby’s crib, exploding in his face. 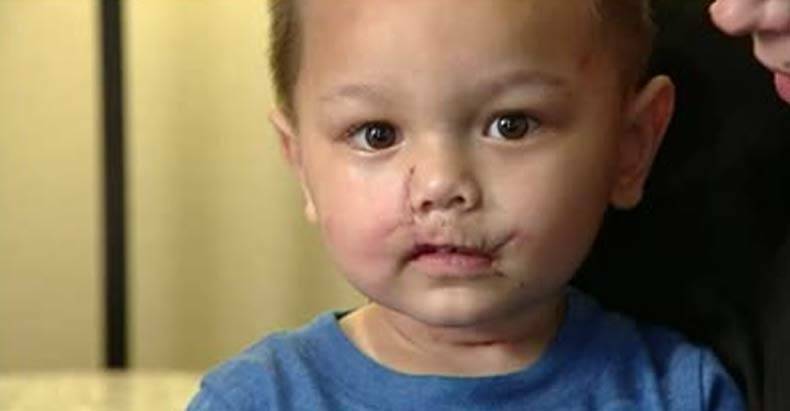 Beyond the disfiguring wounds on the toddler’s face, the grenade also left a gash in his chest. As a result, Bou lost the ability to breathe on his own and was left in a medically induced coma for days after the incident. Bou was not able to go home from the hospital until July. Now, a nearly $1 million dollar settlement has been reached between the family and the county. One of the terms of the settlement is that the family may not sue individuals involved in maiming their son. Instead of coming from the wallets of the negligent officers, it will come strictly from the taxpayers. The settlement does not mean that there can be no further litigation, but that all litigation must be directed at the county insurance policies, not individuals or the county’s general fund. Medical bills for the treatment of Bou’s injuries are expected to reach $1 million dollars. In Los Angeles, settlements to resolve lawsuits against the LAPD amount to over one billion dollars a year. Across the country in New York City, a lawsuit is filed every two and a half hours against the NYPD. They are sued so often, in fact, that the city comptroller, Scott Stringer, said that the 2015 budget would have to include $674 million dollars for settlements and judgments against the police. The budget allotted for police negligence and misconduct is more than the budget for the Parks Department, Department of Aging, and the New York Public Library combined. In October of last year, documents released by the New York City Law Department after a FOIA request was submitted by MuckRock showed over 12,000 cases against the NYPD since 2009. Over $428,000,000 was paid in settlements in these cases over only five years. As of 2014, the city of Chicago had also paid out nearly a half a billion dollars in settlements over the past decade. The money for settlements relating to abuse and negligence at the hands of police officers is not paid by the officers who inflicted the damages, but by taxpayers. It is for this reason that it is important to push for legislation requiring police to carry personal liability insurance. Activists pushing for this change believe that if the money for these settlements came from the police themselves, to protect their own wallets, they would be more likely to refrain from abuse. If an officer caused too many settlements, he or she would also eventually become uninsurable, and be forced off duty. We are paying for their brutality.